Although Placentia covers less than seven full square miles, this lovely community in northern Orange County has gained a national reputation as a desirable place to live. (The National Civic League honored us as an “All American City” in 1971.) Property values gradually appreciated here during the past few years. If you’ve purchased a home in Placentia, you’ll want to take steps to protect your real estate from a pervasive regional problem: termites. The threat termites pose to man-made dwellings concerns real estate industry professionals. Termite prevention often proves difficult in some locations. These voracious insects chew through wood. 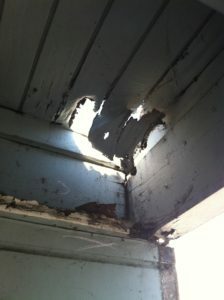 They frequently damage residential properties in Orange County. 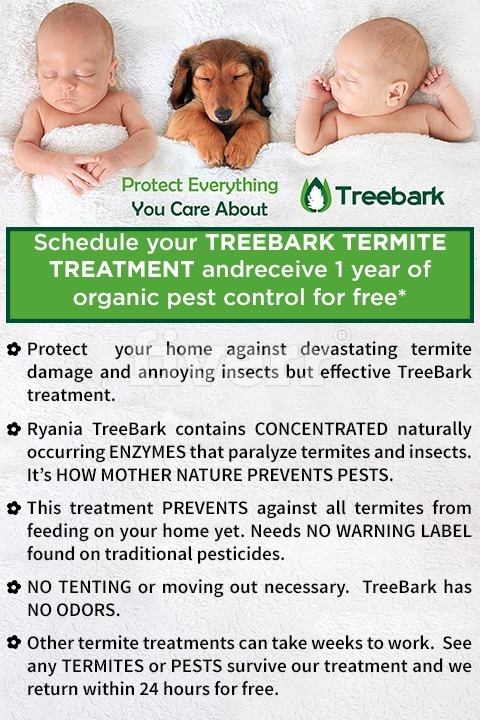 You can depend upon Treebark Termite And Pest Control to help eradicate termites threatening your Placentia property! Every year, termites cause some homeowners financially devastating losses. For instance, in the Southwestern region of the United States alone, termites inflict an estimated $1.5 billion in destruction annually on wooden structures. Replacing rickety or broken fences, decks, porches, stairs, flooring, wall or roofing materials damaged as the result of termite activity costs a lot of money. These statistics don’t even include the sometimes significant costs of using certain termite control chemicals. Additionally, in the past, the last-minute discovery of termites in a residential property on occasion has derailed real estate sales contracts and imposed significant financial burdens upon home sellers. Placentia homeowners can best prevent termite infestations from impacting their enjoyment of their homes by requesting periodic termite inspections. By taking action to identify termite activity at the earliest possible point, you may reduce the likelihood of sustaining further property damage. If humans detect the insects in back yards, for instance, implementing natural termite control measures may help dissuade termites from invading a home. Taking the precaution of requesting a free inspection usually represents a wise investment of time in Orange County. Killing termites usually requires the assistance of trained pest control experts, due to the complexity of the issues involved. The climatic conditions in California enable termite populations to thrive here in some places. Although they cannot live comfortably in Artic locations, termites have spread widely throughout temperate and tropical zones. Some entomologists consider them among the most successful insects on the planet, in fact. To ensure your home does not sustain termite damage in Placentia, you should consider implementing regular, periodic termite inspection in placentia. In coastal California, weather conditions which contribute to flooding, heavy rainstorms, and brush fires sometimes help promote the expansion of termite colonies. When these unwelcome natural disasters occur, they usually leave fallen trees in their wake. The rotting wood attracts teeming termite colonies. Termites which establish nests in an area may invade nearby residential structures. To assist people in Placentia, Treebark Termite and Pest Control offers helpful free residential termite inspections. We’ll examine your home and grounds and let you know if we detect any signs of termite activity. If we discover termites in the yard, for instance, we may suggest natural termite control measures, or construction technologies to form a physical barrier to prevent termites from attacking your home. If we do observe a termite infestation in your residence, we can employ the latest generation of termite control chemicals. In the past, termite elimination sometimes required tenting a home and fumigating the interior with toxins. Today, the development of new products has significantly enhanced the safety and convenience of termite control measures. Your household won’t even need to relocate temporarily when we apply a state-of-the-art termiticide. We use a proprietary product derived from the bark of the Ryania speciosa tree; in the amounts we apply, this formulation enjoys an excellent reputation for safety around people and their pets. To schedule a free residential termite inspection in Placentia, simply call Treebark Termite And Pest Control at 714-406-4919 now. You can also use the convenient website form to reserve your appointment. Requesting a termite inspection remains the easiest way to start implementing an effective termite prevention program in Placentia.